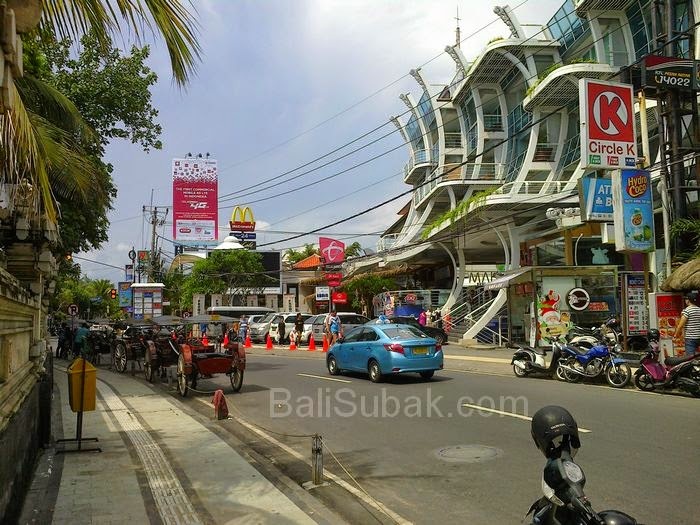 If you want to get to the attractions of Kuta Beach Bali Indonesia, would have to cross a street which is right on the seafront. The street was named Jalan Pantai Kuta (Kuta Beach Street). 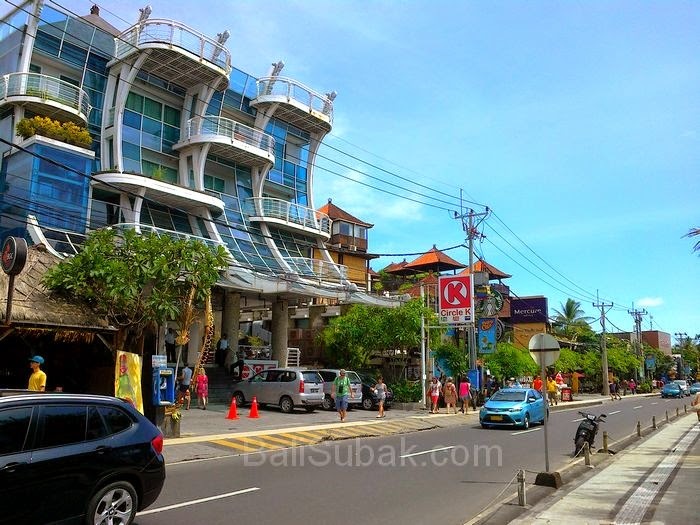 The situation in Jalan Pantai Kuta can be categorized as street is always crowded by vehicles. 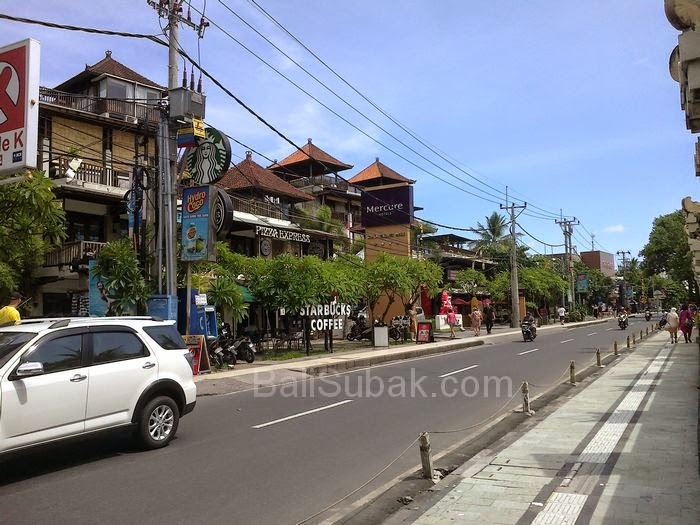 This street is also a parking place for tourists who want to have fun in PantaiKuta Bali Indonesia. This street is the one fig for the vehicle speed. Contrast display visible while in Jalan Pantai Kuta, on the northwest side, or on the right side of the street, there are many hotel building, retoran, cafes. The buildings are not skyscrapers, there is high, but it becomes a row of buildings that look magnificent, when compared to other places in Bali. Bali Provincial Government implement the rule that the construction of the building should not exceed the height of palm trees, or the number of floors in a building no more than four lanta of land. The rules adapted to the culture and religion in Bali. With the aim to destroy the sanctity of the temple and the place is considered sacred by the people of Bali, Indonesia. The buildings along the Jalan Pantai Kuta separated by a wall. Almost all the buildings located very close together. The street to the beach in the given barrier wall. Beach with street bordered by high walls intended that the existing sand along the coast street because it does not lead to blown by the wind. Before the street to the beach blocked by a wall, always spillages of sand that is along the beach toward the street. The street becomes soiled by sand. That's because the position of Kuta Beach is higher than the street. Indeed Kuta Beach in ancient times, is located lower than the mainland. But since global warming, higher sea water. Each year the higher sea water. That is why the position is higher than Jalan Pantai Kuta beach. Before drainage made better, in Jalan Pantai Kuta always flooded during the rainy season. Because the position of the lower path of the coast, making it difficult rain water flowing to the sea. The sea is a final disposal of rain water flow. Having made better drainage, water flowed further and ultimately towards the sea. 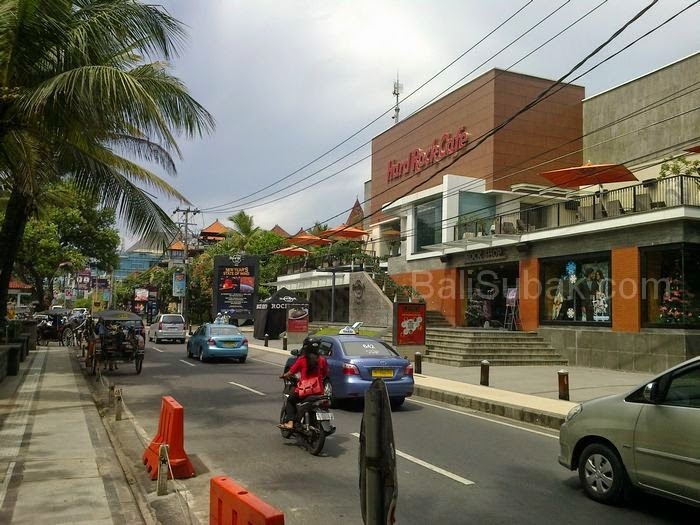 Jalan Pantai Kuta edge is also a place to hang out by young people in Bali. This street is always crowded during the afternoon. Because during the afternoon in the atmosphere is very pleasant place. See foreign tourists who walk from east to west and vice versa. Visit the store to another store. While drinking a cold soft drink. Sidewalk Jalan Pantai Kuta not only as a place for pedestrians. Sidewalks are also used for a jog by tourists and locals. Sidewalks in Kuta made different from anywhere else in Bali. More ramps, flat and smooth, friendly to people with disabilities, and maintained. Unlike the sidewalk in other places in Bali, high, rough, lots of holes, and not friendly to people with disabilities.